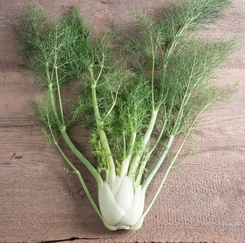 Don’t confuse this vegetable variety with common fennel, which is grown mainly for its seed. This might be called the licorice vegetable, except that it’s a fair bit milder than actual licorice (“The flavor of fennel, however, is sweeter and more delicate than anise and, when cooked, becomes even lighter and more elusive than in its raw state”); it’s one of those vegetables wildly popular in many national cuisines—most of the Mediterranean cultures, who usually call it by its Italian name, finocchio, feature it—yet almost unknown in the U.S. We here like it in moderation, especially mixed in with other hearty vegetables in some sort of olio or stew. The paucity of our usual seedsmen’s catalogues is demonstrated yet again, when we note that this vegetable, if offered at all in the U.S., is usually set out under the generic name, with no hint of particular cultivar, despite the literature referring to numerous types—we located 20 cultivar names with little effort (most from U.K. sources). Zefa Fino: Early variety but can be grown throughout the year. Slow-bolting. High yield in spring. Big tuber, bright white and very firm. Zefa Tardo: Medium late variety, selected for cultivation in fall. Yields are regularly high and of best quality. White, slightly green coloured tuber, firm and heavy. If the Zefa Fino “can be grown throughout the year”, why mess with anything else? In our climate, the plant is best simply direct-seeded. It’s a cool-weather annual, so it can be planted in early spring or in mid-summer; but early-spring plantings are much more subject to bolting—the chief problem with this vegetable—plus, though the plant is ”half-hardy”, late spring freezes can kill seedlings (incidentally, the Zefa Fino cultivar is also reputed to be more bolt-resistant than most.) All for all, then, we’re better off to just direct seed, say around July 1st (one source says it can be planted “right up till August”). Seed catalogues typically list Zefa Fino as ”80 days”, though other sources report growing times as long as 120 days (yet one—a reliable northern seed house at that—says “55 days”); but even at the worst, it’ll be done well before really cold weather sets in. Ideal plant spacing is not clear to us. The actual growth doesn’t require a lot of space, but finocchio is a notoriously greedy feeder, and some sources recommend a 12-inch spacing just to be sure each plant has enough soil to properly nourish it. But, especially if one is growing it in a container of some sort, however big, one has complete control over the soil quality and fertility, so closer spacings may be possible (assuming, then, intensely rich soil). We’ll just experiment. After seeding, keep the soil moist until the first leaves appear—probably a couple of weeks; after that, water, but don’t over-water. Beware! Any check in growth with finocchio will induce bolting, and there goes your hope of bulbs. Keep them regularly, evenly watered—and cultivate with a light hand, for disturbing their roots also famously induces bolting. The plants will eventually make a swollen oval structure a few inches in diameter just above the ground. Some gardeners pull soil up around the developing bulbous base to blanch it, but that’s just not necessary. The stems grow two to three feet tall. Timing is very important when harvesting the bulb. Once the bulb has fully formed, the plant will want to send up a flower stalk—which will shrink the bulb immediately. So be sure to harvest the bulbs when they are no more than 3 inches across. The plant is an annual that is planted for the thickened bulb-like base of the leaf stems. The scented flowers are hermaphrodite (have both male and female organs) and are pollinated by insects, making the plant self-fertile. It's another member of the edible-root Umbellifrae family, along with carrots, dill, parsley (including rooted parsley), celery, parsnip, coriander, and some other less-common herbs. Umbellifrae are easily recognized by their characteristic lacy top growth. One source observes that “If a few plants are left to flower, they become extremely attractive to a large number of beneficial insects which prey on garden pests.” Nice to know. An American consul in Florence, Italy, sent fennel seeds to Thomas Jefferson in 1824, but the mildly anise-flavored stalk vegetable did not become popular (and widely available) in the U.S. till the last few decades. “Finocchio” is the proper Italian—and more or less universal European—name for this vegetable. But be aware that, in Italian, the word is also slang—a rather vulgar pejorative epithet—so have a care with its use. It was last modified on Tuesday, 29 January 2019, at 21:40 EST.